Pre-orders are now available for a couple of comic books I'm excited about from two different, but equally excellent artists. The first is one I've been anticipating for a while: Lauren Monger's Sleepwalking, due for publication from Space Face Books next month. 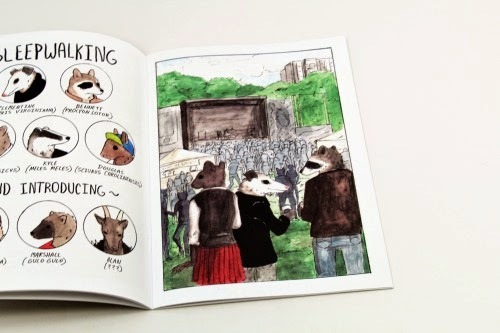 Monger's TerribleTerrible comics starring her possum main character, Clementine, and a group of 20-something friends as they negotiate finding jobs, responsibility, and trying to get by, are hugely popular on Tumblr, and I believe this is a first print work featuring those characters. The grungy beauty of Monger's painted comics are one of my favourite things about it- evocative and just so ink keeping with the characters and the world she's built. 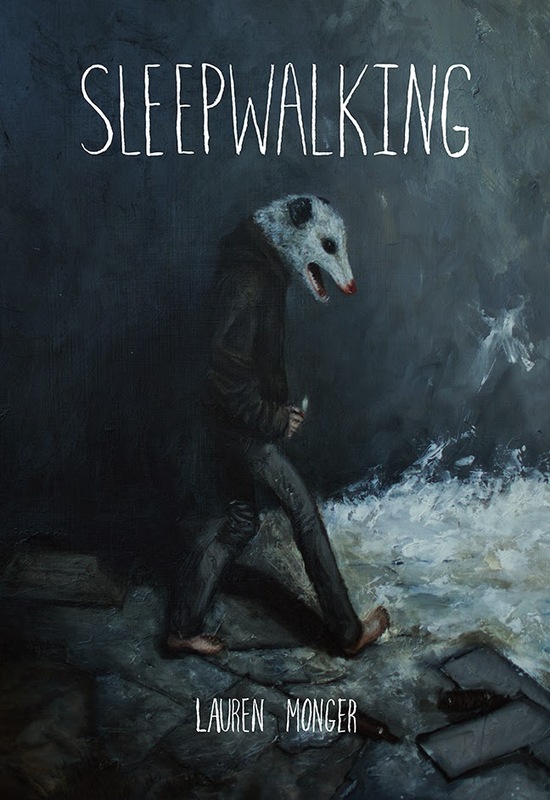 Sleepwalking is a 36-page full colour, saddle stitched comic, which you can buy here for $6. I put my order for this in in December, and wrote about Monger's comics last February, if you'd like to read a little more about them. 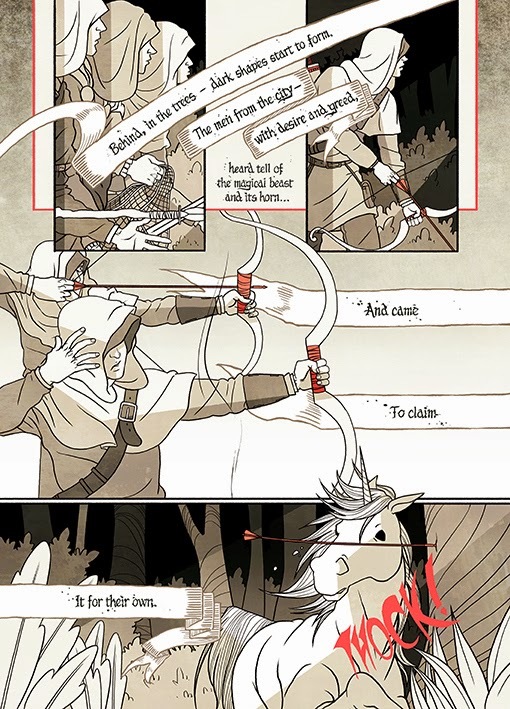 The second comic was a pleasant surprise in terms of announcement, from Kate Brown. Brown's largely been working on children's comics for UK weekly The Phoenix since her last book, Fish and Chocolate. 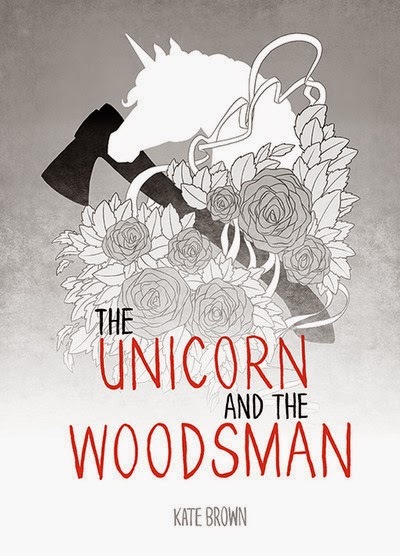 I've been wanting to see more adult fare from her ever since (although I loved the magical but sadly uncompleted Spider Moon), so this new comic, titled The Unicorn and the Woodsman, is very welcome. 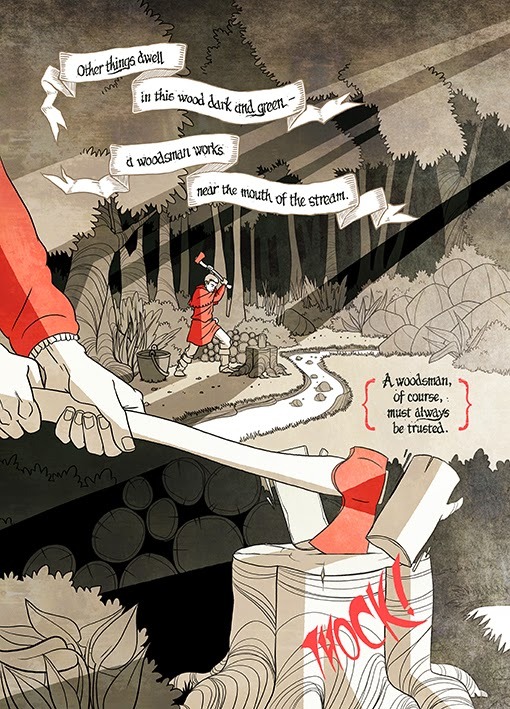 It’s a rhyming fairytale-style comic about a unicorn's meeting with a woodsman, and from the preview pages, it looks like Brown's taken on a bit of a new style to fit the subject and tone- that red and those faded blacks are very striking, too. 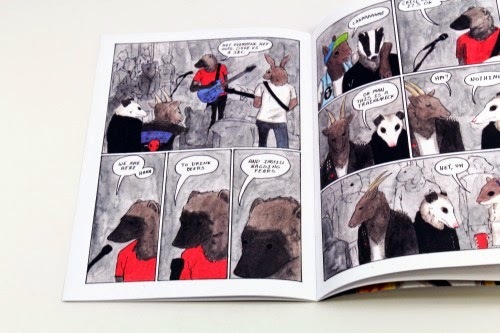 Brown is currently taking pre-orders for the comic at a special price of £4 ($6.20) which will run until the end of January. The Unicron and the Woodsman is 20 pages in length, with full-colour cover and interiors, and you can order it here. If you're looking for interesting, quality comics, these are two I really can't see you going wrong with.